The National Education Association’s Read Across America Day is an annual reading motivation and awareness program that calls for every child in every community to celebrate reading on March 2, the birthday of beloved children’s author, Dr. Seuss. In cities and towns across the nation, teachers, teenagers, librarians, politicians, actors, athletes, parents, grandparents, and others develop NEA’s Read Across America activities to bring reading excitement to children of all ages. Whether they take place in another country or a made up world, stories transport the reader to a new place. Not only do children’s books allow kids to reflect on their own lives but it also gives them the chance to learn about someone else’s. According to a Scholastic report, reading to young children is related to stronger subsequent academic achievement; it is important to note that not everyone in the world has access to reading materials. This week’s map features the birthplace of famous children’s authors. To learn more about each individual author, click here. 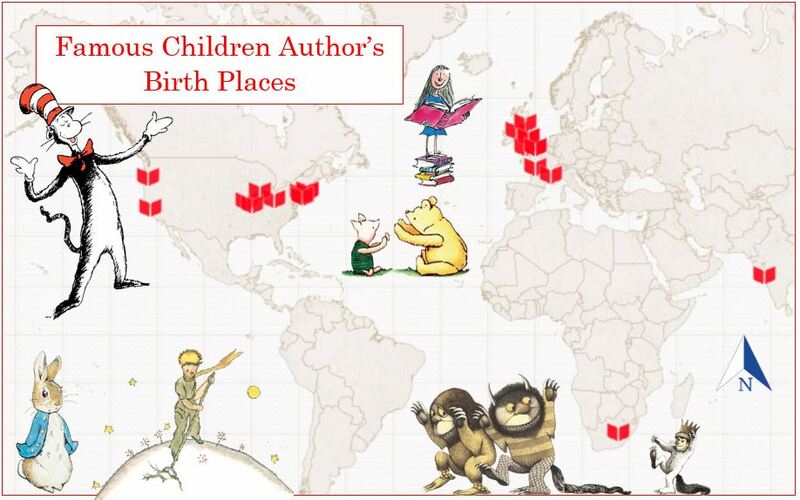 As shown on the map, many of our beloved children’s authors come from the United States or the United Kingdom. Despite understanding the importance of diversity in our lives, this is not being shown in children’s books. Although Read Across America Day encourages children to read; adults should take time out of their busy schedules to read as well. After realizing that her bookshelves were “crowded with English-language books, mainly from English-speaking countries,” Ann Morgan set on a challenge to read a book from every country in the world over the course of one year. She compiled 196 recommended books and placed them on maps separated into continents.